Hs2 news: Phase 2a to Crewe Hybrid Bill 2nd reading. The 2nd reading of the Hs2 Phase 2a West Midlands to Crewe Hybrid Bill has been scheduled for Tuesday 30th January. A number of important decisions are made at 2nd reading. Firstly, the principles of the bill are established. A debate is held, the length of the petitioning process is decided and finally, the premise of the bill is assured. This final bit means that 2nd reading is regarded as Parliament’s intent. If the bill passes with a large majority (as the phase 1 bill did), Parliament’s intent is very clear. After the Second Reading, there can be no amendment which can destroy the principle of the bill. After the bill passes 2nd reading the petitioning committee (made up of MPs unconnected with the project) will be established. The composition of a select committee reflects the party balance in the House. The select committee will mostly sit in a quasi-judicial capacity. It will not be looking at principle or policy; its focus will be restricted to addressing mitigation, compensation and adjustment. It’s the same after the bill passes the formality of 3rd Reading & goes on to the Lords. The whole petitioning process isn’t rerun, and the Lords will have no power to reject or fundamentally alter the Bill. So, what does this mean for the Stophs2 campaign? They’re toast! It means the focus has moved away from phase 1 and shifted North. Their campaign’s always been very weak and disorganised on this section. All their national groups were Phase 1 based. There are very few active ‘action’ groups locally. Staffordshire’s is a great example of this, they were always divided by the ‘cult of personality’ as local eccentrics or ‘kippers’ (UKIP supporters) tried to use the issue for their own ends. As UKIP has collapsed and is on the verge of bankruptcy, don’t expect much organised opposition there! The recent Stop Hs2 petition on the Government website is a useful indicator as to the health (or otherwise) of the anti Hs2 campaign in the area. Here’s a spreadsheet from yesterday which has a breakdown of the signatures by constituency. From this it’s easy to see how few active anti Hs2 ‘action groups there are. There will be number of things to watch out for at 2nd reading, including the size of the majority for the bill, the number of MPs who vote against – and where their constituencies are. After that there’ll be about 3 weeks for people to petition the Committee. The number of petitions will also be of interest, especially as this time electronic submissions will be accepted. For phase 1 petitions actually had to be delivered to Parliament in person. I wonder if StopHs2 will be organising a rally outside Parliament on the 30th the way they did for 2nd reading of the Phase 1 bill. That was an embarrassment as less than 100 people turned up! This was meant to be a national demonstration from all the different phases of Hs2. Remember over 6.5 million people live in constituencies Hs2 will pass through, yet less than 100 people turned up to protest! If there’s no demonstration this time it will say an awful lot about how far the Stop Hs2 campaign’s collapsed. On the 26th March the Hs2 Petitioning Bill Committee published its first interim report which contained a series of requests & observations generated by the petitioning process. You can find their report here. Yesterday Hs2 Ltd published their response, which you can read here. 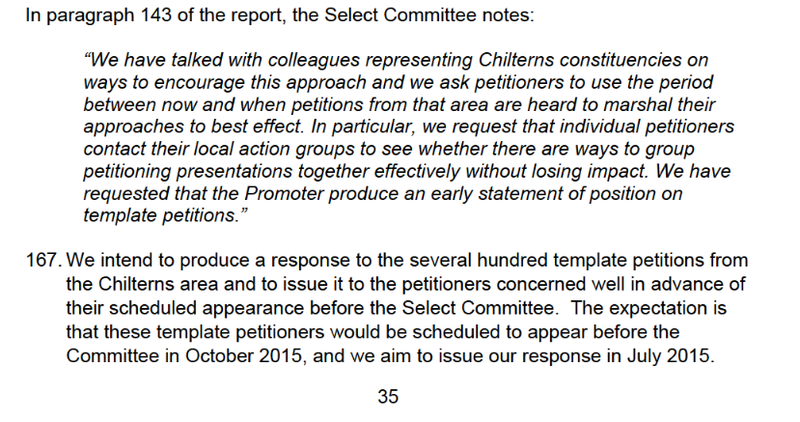 Cut & paste petitions were a centrepiece of the anti Hs2 mobs tactics. They hoped that, if they swamped the Committee with petitions they could bog down the whole process & delay Hs2 long enough that a new Government would decide to cancel the project due to delays & costs. Like all the other anti Hs2 tactics, it’s failed. The Petitioning Committee have made it clear they aren’t going to let themselves get bogged down this way & neither are Hs2 Ltd.
Another interesting aspect of the Petitioning Committee’s report is that they are looking to make recommendations on the conduct & process of future Hybrid Bills (such as the Phase 2 bill). What’s the bet that one of those recommendations will be to close the loophole of ‘template’ petitions & prevent the threat of future bills getting bogged down in this fashion?